If you have decided to buy a KitchenAid stand mixer after reviewing our article “The best stand mixers of 2019“. now its time to explore some of the best attachments offered by KitchenAid, to give the most use of your stand mixer, and it one of the best things about owning a KitchenAid stand mixer is that it can do so much more than just mix dough. Even better, since KitchenAid mixers are so popular, there are new attachments being introduced regularly both by KitchenAid and other companies. *Almost every attachment is designed to work with any kitchenAid stand mixer, eventhough always make sure before buying that the attachment is compatible with your stand mixer. by double-checking the model number. Here are our seven must-have stand mixer attachments for your kitchen. Home-making ice cream is fun, especially it lets you customize the flavor that fits your family taste and yours. since stand-alone ice cream maker can fill a lot of space in your kitchen, besides ice cream is a seasonal treat, so buying this attachment could be a significant investment. the attachment works almost on every KitchenAid stand mixer models, bowl lift and tilt head ones, the bowl just lock in place regular like your mixing bowl. the attachment allows you to produce 2 quarts of well soft-textured smooth ice cream in 25-39 minutes, sorbet and gelato too. the ice-cream maker is bit loud, but it quiet compared to other stand mixer ice cream makers. This attachment will allow you to start making your own healthy juices and stay away from juices with sugar, and enhancers. The juicer is slow because it used mastication to produce the juice, which decrees nutrients loss and provide many health benefits. as well can be used to produce plenty of sauces and dressing. it can process hard, soft and leafy ingredients. includes a 3 pulp to choose from, for those who like consistency variations in there juices or sauces. A wide chute that can fit many whole ingredients which eliminate the needs of pre-cuts. *comes with citrus juicer with strainer for pulp and seeds that can be attached to the front of the stand mixer. 3 pulp screens to choose from. Many parts to put together and clean. It is an excellent option if you don’t have enough room for a stand mixer and a food processor on your counter or cabinet. The attachments comes with a dicing kit, reversible shredding disc, slicing disc(with a side handle for multiple thickness settings), julienne disc and secure storage box, to cover almost any food prep in your home kitchen. Every part is dishwasher safe, so its perfect for those who love to throw everything in the dishwasher. Side lever to adjust the slicing thickness. 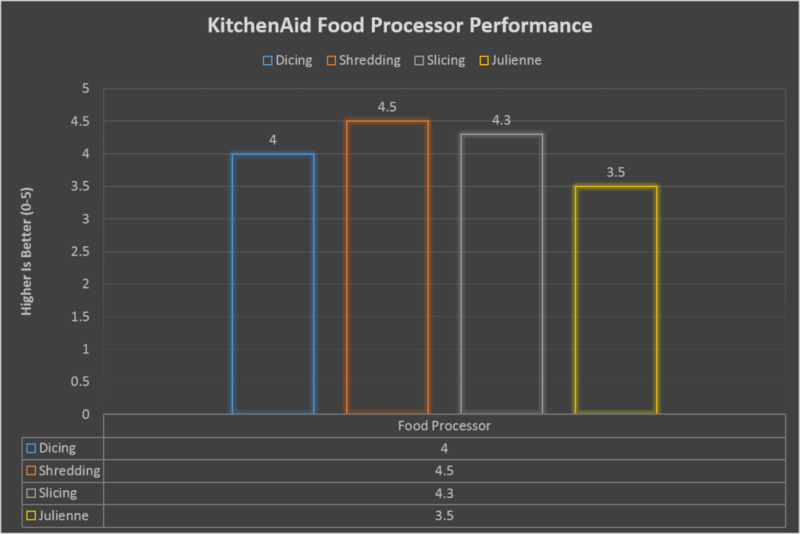 does not support chopping,kneading and mixing features unlike standard food processors. A must-have KitchenAid attachment for all of those who are interested in making pasta, go through the link to read more about this attachment and more electric and manual pasta maker reviews. Nothing can beat ravioli especially if it is a fresh one, making a fresh ravioli can be a time-consuming process, it requires rolling the dough, placing the filling, placing another dough sheet, sealing and cutting. This KitchenAid ravioli maker comes with hopper and wide roller to produce a 3 evenly filled ravioli pockets per row, in a short time. The attachment is really easy to clean and comes with a scrubbing brush to help hand-wash it. *The ravioli-making process is manual, and not processed by the stand mixer. Produce 3 rows of ravioli at once. This attachment comes with six blades for assorted six noodle styles: Rigatoni, bucatini, small and large macaroni, fusilli and spaghetti. To produce your desired shape all you have to do is to place the on of the six blades into the ring and screw it to the attachment, and then feed the dough into the hopper. comes with a wire cutter to adjust the length, and a tool to help guide the dough in the top. Another great attachment for those who are in love with baking and working with fresh ingredients. with this attachment, you can grind any low-moisture/non-oil grains corn, wheat, oats, and others, which add extra flavor and aroma to your meals. the attachment features a plenty milling setting from coarse crack wheat to fine flour. *Always give some rest time to the mixer if you want to mix immediately after milling. Did I miss one of your favorite kitchenAid stand mixer attachments?